It's time of the month to update my current skin condition with you guys! Nothing has changed in my skincare regime, except the fact that I have to continue with my pills to control and balance my hormonal acne. I'm not gonna lie that my skin has definitely improved leaps and bounds under the care of Dr. Ram! This is my 4th sessions of Combi laser and based on my previous post (HERE), you can really see the results yourself. I don't have a specific answer for you when will my scars heal completely. All I can say is that it's only the 4th sessions and I'm happy to see how much the scars has lightened as compared to my first trip to TWC! The room where I get my Combi Laser/Acne treatment done! Fresh bare face and all ready for the 4th sessions of the laser! Cooling gel before Dr. Ram come over and perform the laser treatment. The Combi Laser is being done on the areas where my scars and brown marks are most prominent! If you ask me about the pain level, I would say none. I don't feel any pain at all, it feels better than facial and it doesn't require more than 1 hour for that. 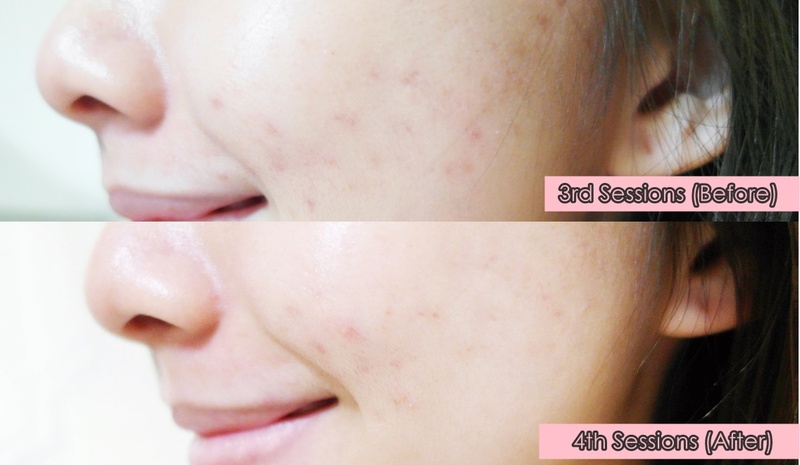 Combi Laser is targeted to improve your overall skin condition. It helps to get rid redness and brown marks on your skin as well.There's a downtime for Combi Laser, which will take 2 - 3 days later for you to notice the flaking and peeling from the laser (in a good way of course..) because your skin is renewing and that's where you'll start to notice your scars/marks has lightened from the laser! Please X it if you can't stand gross images..... hahaha. Left cheeks, spot the visible improvements after the 4th laser!!! P/S: Non-edited, adjusted a bit of lighting in the pictures for you to see even clearer. Right cheeks, there's still a lot improvement needed for my right cheeks. :( This side is prone to the most breakout esp the time of the month!! *roll eyes* I didn't choose to be in this gender lol. This is why Dr. Ram has prescribed me antibiotic pills to control and clear them faster! Let's moved on to Facial which was arranged on the 27th September! Lol, super slack outfit to town that day! As usual, getting rid the dead skin is so important as it plays a part in making your skin look really dull. This is the junk that kept in my face for the past few weeks.... thank god. I had them removed!